It’s about a 3 hour and 45 minute drive from Portsmouth, NH to Southwest Harbor on Mount Desert Island (MDI), if you take the main highway I-295. 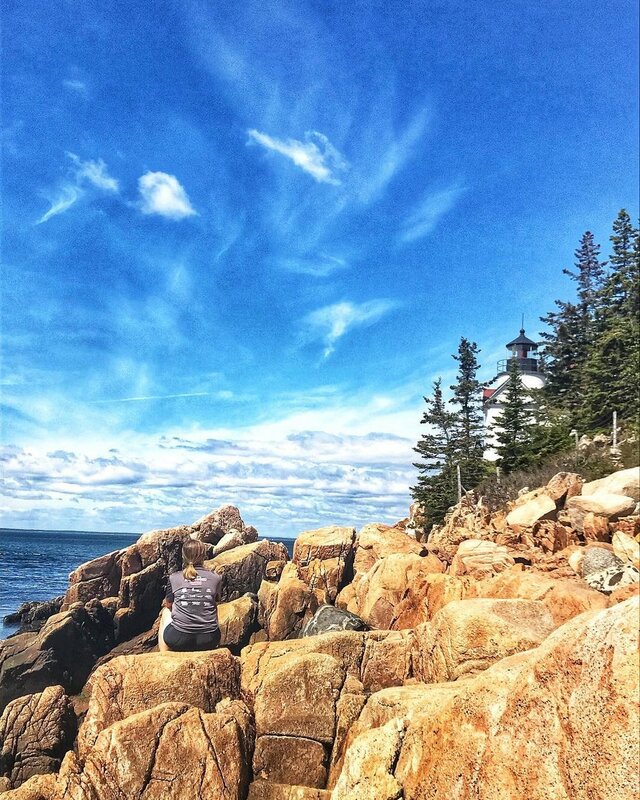 We decided to take our time driving up Coastal Route 1 in order to see some of Maine’s picturesque coastal towns. Our first stop was Portland, ME to pick up some donuts at Holy Donut. I’m not really a donut person, but Chris loves them and I had read a lot about this shop. I will say, these donuts were delicious and worth the hype. They’re made from scratch each morning from Maine potatoes. We got lemon, and dark chocolate sea salt donuts! Portland is just under an hour from Portsmouth, from there we headed another 20 minutes north to the L.L. Bean flagship store and outlet in Freeport, ME. I know outlets can be hit or miss, but I was pretty disappointed with this one. The selection wasn’t great and the prices didn’t seem significantly discounted. Maybe we were there on an off day? If you’re an outlet shopper, they were really nice and worth a stop. From there we continued our way up Route 1. I expected the entire route to be scenic, but I feel like it took about a solid hour until we started passing through cute towns and seeing the water. I had read that Red’s Eats in Wiscasset was one of the best lobster shacks in the state. My opinion now, you really can’t go wrong if the shacks are right off the water where the lobster boats come in. It’s all over the internet that if you don’t get to Reds when they open, be prepared to wait in a long line. This rang true even in May before the tourist season had gotten started. So we promptly walked across the street to Sprague’s, which honestly had a better view of the water. Before hitting the road we stopped at a little homemade ice cream shop and chatted with the owner who was a 20-something from the south who just decided to pack her bags one day and fulfill her dream of living in Maine. Not going to lie, was a little jealous (and inspired) of her. 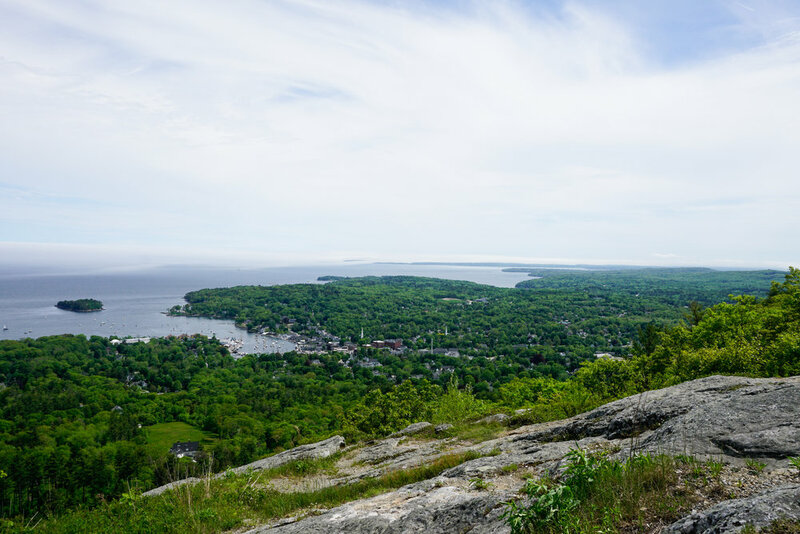 We continued driving north and stopped off in Camden Maine and made a quick trip up to the top of Mount Battie. One could easily spend a week staying in some of these smaller coastal towns. We stayed at the Kingsleigh Inn in Southwest Harbor. I can’t say ENOUGH about this inn or staying on this side of the Island. The inn has seven guest rooms and one suite. I selected this inn because all the rooms had private baths and many had balconies with a water view, which was the #1 thing I wanted in an inn on MDI. The price couldn’t be beat when you compared it to inns in Bar Harbor without any outdoor space or water view. The inn keepers (a husband and wife) couldn’t have been MORE delightful and we loved chatting with them each day, by the time we left they truly felt like friends. We had a gourmet breakfast every morning, happy hour in the afternoon, and my favorite part was the beverage bar with a never ending supply of coffee, tea, and a fresh homemade baked good. Chris’ favorite part was the in room port and house made chocolates they left each evening. For anyone looking to stay on MDI, I highly recommend Southwest Harbor. The town was adorable, essentially one street. We could walk right out the door of our inn and to any of the restaurants and shops. There are essentially 4 towns on MDI: Bar Harbor, Northeast Harbor, Southwest Harbor, and Tremont. The latter 3 have all banned cruise ship entry, so although Bar Harbor is cute, it is very touristy and gets insanely busy when the cruise ships pull in for the day. It only took us 20 mins to hop over to Acadia National Park from our part of the Island. Only morning it was warm enough for breakfast on the porch. We had the best time in Maine, we biked and biked and biked some more. Our first full day on MDI we biked around Southwest Harbor and down to Bass Harbor lighthouse. We grabbed a quick lunch at the tiniest cafe across from our Inn called Side Street Café. The food was fantastic, and I felt like I could have been sitting in Luke’s diner. That afternoon we did a sea kayaking tour which was SO much fun. Our guide was awesome and we met this fantastic couple from Germany. It was too rough on the water to take pictures but we saw a TON of seals. It was hilarious to see their little heads pop up out of the water and stare at you with their looks of confusion. We picked up some awesome tips from our guide. Unfortunately, with how overrun Bar Harbor is getting he said it wasn’t going to be long until that spilled over to Southwest Harbor. We ended that day with carrying out lobster rolls from Beal’s Lobster Pound and going back to Bass Harbor lighthouse for some sun set photos. The next morning, Chris enjoyed a leisurely breakfast at the inn and I headed out early for a photography class in Acadia National Park. We had the best group of people on our tour (oddly enough, a surgeon from a VA in Maine and a 4th year pharmacy student). The guides were awesome and I took away some new pointers for composition and maybe more importantly, picked up some excellent local recommendations! We spent the remainder of our days biking several of the carriage roads in Acadia. 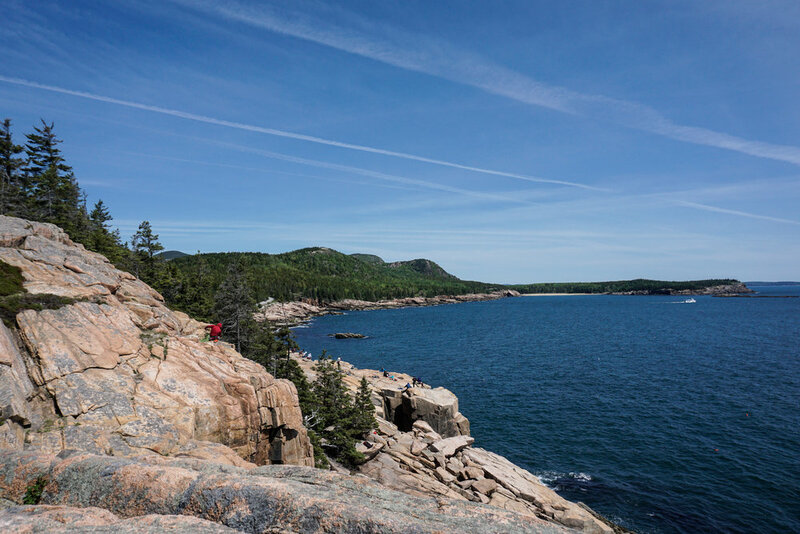 For those who aren’t familiar, Acadia National Park has around 45 miles of crushed gravel trails that are restricted to cyclists, horses, and pedestrians. They are some of the most scenic rides I’ve ever taken. Chris had his hybrid and I have a gravel rated road bike and we successfully biked 25 miles of the roads without any popped tires! Though steep descents on a road bike, on crushed gravel, was a bit terrifying. During one our rides we stopped at Jordan Pond House for tea and popovers. Was it overly touristy? Yes, but I’m glad we stopped, it was a fun snack break during our ride. On one of the only clear nights we got while on the Island, I somehow convinced Chris to go back to the park after dark. I got a tip on the photography class about a great beach for star gazing. We sat under blankets trying to keep warm (temps were in the 40s) while watching the most incredible stars come to life. The drive home from the park, back to our inn, with the moon roof open and the windows down was probably a top highlight of the trip for me. We didn't see a single other car that night in the park, probably wouldn't be able to say that come mid-June. Sand Beach in Acadia National Park. One of the few public beaches. The sand is largely comprised of tiny shell fragments. We star gazed here and at night locals bring their dogs here. Hidden spot our photo guide took us to. Looking back out to sand beach and the Beehive. Rock climbers in the foreground. Photo break during one of our bike rides on the carriage road trials. Photo stop while biking the carriage road trials. View from our bike ride on the carriage road. After four days in Maine, we packed up again and headed to Vermont. One of the other couples staying at the Inn where from Burlington, VT and gave us quite a bit of tips. Based on their advice, we changed our route to travel through the back roads of New Hampshire and the White Mountains. It was a BEAUTIFUL drive, next time I’m back in New England I will be adding on a stay in the White Mountains. There was something so special about each area we stayed but Vermont stole my heart. We stayed at Fat Sheep Farm about 11 miles south of Woodstock. Guys, I was about to call in my notice to the VA, and move in on this farm. First of all, Vermont is so beautiful and so green, but when we pulled up to the farm I fell in love instantly. The farm was still in their first year of operation (in regards to renting cabins) and as such we got in at a tremendous price though I’ll happily return and pay whatever they’re charging. The cabins are beautifully designed and outfitted with the most comfortable bedding I’ve ever slept on. The owners left fresh farm eggs and baked scones for us. Throughout your stay you can purchase more eggs and help yourself to any of the produce. Each cabin has a thoughtfully put together binder full of the owner’s recommendations for food, hikes, area activities, etc. They also have composting and recycling set up in each cabin. There are also farm activities you can take a part in, but as the owner said, “if I don’t hear from you or see you, I’ll assume you’re enjoying yourself.” We met up with the owner for about an hour hike through the farm and learned about how he got his start (fascinating) and all about his farming and operation. We loved it and totally geeked out over all we learned! The last morning we were there we joined him and his wife for milking the sheep and letting the animals out of the barn into their pastures. This place has something for everyone. You can make a fire, they have lawn games set up, and a host of farm activities including bee keeping and cheese making you can participate in. What I loved the most was this wasn't a large tourist operation. Just a small family, who already owned a farm, and later built 4 beautiful cabins on their property. The best part was the owners are foodies from Boston and when we arrived in Vermont we were in foodie heaven. We spent our time hiking each morning, a bike ride in the afternoon, and eating amazing food. Thanks to their farm fresh eggs and produce we cooked breakfast each morning in our cabin. My favorite part of Vermont were all the honor system farm stands! I was not in St. Louis (or Chicago) anymore. Our first evening the owner told us about a great stand down the road in Quechee. We pulled up to an open barn full of homemade cheese, yogurt, etc. We picked up some goodies for our stay. One of our days in Vermont we headed north to Hill Farmstead Brewery (voted #1 brewery in the world). I told Chris’ in exchange he would need to take me to a local creamery to learn about Vermont cheese. There are a lot of big tourist attractions/operations to learn about cheese and or maple syrup making in Vermont, but I was hoping for a smaller scale operation. We looked at the cheese route map and saw that Neighborly Farms was on our way to the brewery with a minimal detour. We pulled up the cutest little place and walked in to just a girl sitting a desk. We told her about our trip and how we wanted to learn a bit more about cheese. She was super sweet and went and got the head cheese maker who immediately opened up some cheese for us to snack on and gave us a tour. While talking to them we learned the receptionist’s family owned a sugar house and makes maple syrup a few miles away. After telling her we had not visited any sugar houses in Vermont, she called up a few family members until she found one that was around to give us a tour. From Neighborly Farms we followed her directions 10 minutes away (to an area we never would of found) and met up with her sister who was home from work for the day and she gave us a tour! We learned a ton. They only sell their syrup at local farmers markets and to a few high end restaurants in New York. We spent the rest of our day at the brewery before making our way back to Woodstock for their farmers market and dinner. I can’t end a post on Woodstock without talking about our dinner at Mangalista. It was literally one of the best meals of my entire life. The farm we stayed on supplies some of their produce. It’s a small restaurant and completely run by the two 20-something owners (one works as the chef, the other front of the house) along with one sous chef and one waitress. They all worked as a team, and the chef brought out all the food. There’s no way this place doesn’t end up on the short list for a James Beard Award. I cannot wait to make another trip back to Vermont and to Fat Sheep Farms. Woodstock, I’m also convinced, is the most Stars Hollow like town in existence. Famous Cheddar Soup at Simon Pearce. OMG - yum. After 3 too short days in Vermont we packed up and headed to Grand Rapids, Michigan to meet up with my friend for our first open water triathlon! We stopped overnight outside of Cleveland because 8 hours in the car is my limit. We had a great weekend in Michigan. The triathlon was well organized, but didn’t quite go as I had wished, nor how I had trained for. However, I somehow mustered the strength to finish after a stressful swim and at the end of the day that’s what counts! The day after our triathlon we headed back to St. Louis in all its summer glory (think temperatures that were 40 degrees higher than New England) and our pups. We’ve been back now for a month plus now and I’m still in a post-vacation funk! This was the longest vacation either of us has ever taken and I’m still counting my blessings we were able to pull it off and dreaming of what we can pull off next! Wet suit strippers. Easily best part of the tri. Cheers! Enjoying a local Vermont Rose Cider post Tri! Kingsleigh Inn, Southwest Harbor, ME: fabulous inn with great inn keepers and stellar breakfast. Never without supply of hot coffee, tea, and baked goods. The inn keepers are a wealth of knowledge on the area. Won’t look elsewhere for lodging on MDI. Fat Sheep Farms, Hartland, Vermont: loved, loved, loved everything about this place. You should run, do not pass go, and book a vacation here immediately. Baymont Inn and Suites, ADA, MI: I guess this fit our needs post triathlon however they were listed on the Triathlon lodging website as offering a special rate to those participating. The hotel and staff were completely unprepared for us. There was no extra help at check-in and the staff wasn’t aware of the timing of any of the events. I had to specifically ask they put on breakfast earlier enough for the participants. There were also sketchy people hanging out in the hotel’s parking lot. It was close to the race site, but I wouldn’t stay here again. Holy Donut, Portland, ME- worth a visit. If you're not there early, they sell out of the most popular flavors. Sprague’s Lobster, Wiscasset, ME: I’m not sure if Red’s Eats would have been substantially better. The crab and lobster roll was okay. Probably one of our least favorites of the entire trip. But there was no wait and the view was lovely. Coda, Southwest Harbor, ME: small plate’s restaurant with live music in Southwest Harbor. Made for an easy fun meal. Our dishes were hit and miss, some were delicious and others were just okay. By far our favorite item was a soup that was on special. Definitely a good option to keep in the mix, but I won’t rush back next time we visit the area. Quiet SIde Café, Southwest Harbor, ME: LOVED. Nothing special from the outside, tiny local café full of locals (which was half the entertainment). I’m kicking myself that I didn’t order the lobster roll because apparently they’re known for theirs but the crab roll I had was delicious. They had other simple but yummy entrees such as your classic burger or grilled cheese. 100% would return. We got a slice of their homemade blueberry pie which was divine. Side Street Café, Bar Harbor, ME: recommended to us by our Kayaking guide as this is one of the only restaurants in Bar Harbor to stay open year round for local residents. They’re also very supportive of the community. Good selection of beers, cocktails, and burgers. They’re known for their mac n’ cheese. I got their lobster grilled cheese, honestly, the grilled cheese was so damn good, I sort of wished I had just gotten the plain grilled cheese. Great food, would definitely go back! Havana, Bar Harbor, ME: a Latin American restaurant in Bar Harbor, supposedly one of the best restaurants in town. Honestly, the area is just too touristy for really, really, good food when you're used to getting really, really, good food back home. I think you’re mostly better off sticking to the lobster shacks and local cafes. Overall it was good, but still doesn’t compare to the good restaurants in St. Louis and Chicago. Thurston’s Lobster Pound, Bernard, ME: we dined here our last night when it was cold and rainy. We lucked out with a spot by the fire. Chris ended our trip with a traditional lobster dinner (where you get to select your lobster out of tank- a little much for me). I stuck with a lobster roll, research! It was good, but we both preferred Beal’s. Worthy Kitchen, Woodstock, VT: oh my heaven, SO good! Recommendation from the Fat Sheep Farm owners. Local fare and amazing burgers (including vegetarian) and fantastic sides. Great local beers on tap- or so Chris told me. You either stand in line to order at the counter and then have a seat (the line was god awful long) OR you can have a seat at the bar and the bar tenders will serve you. No brain-er. Pi Brick Oven Trattoria, Woodstock, VT: slow service and I’ve never seen an establishment be stingier with their toppings. Would not recommend, in fact I’d advise against ever even considering it as an option. Simon Pearce, Quechee, VT: a tourist destination? Sure is, but I actually would recommended fitting this in! Simon Pearce is known for their glass blowing and all of their glasses etc. are their own glasses. It’s a beautiful white linen table cloth and nice glass ware kind of place but it was well worth the stop in for the famous Vermont cheddar soup! We wanted a light lunch and stopped in for a salad and soup and then checked out the glass blowing downstairs. I would go back for the soup alone. If you walk around the glass blowing, you can head out back for a great view of the Quechee Bridge. Mangalista, Woodstock,VT: What can I say? You should actually book a trip to Woodstock to just eat here. That is all.